This past month has been filled with recognition events for Volunteers and we made nominations to all these Awards recognising our hard working Volunteers. It was great to see a number of our Volunteers recognised at these events and there is a number of articles on their achievements in this newsletter. Firstly we would like to highlight Lesley King for being recognised as Senior Volunteer of the Year (announced at the Parliament House Volunteer of the Year Awards) and then there was Rod Hocking who was recognised with a Senior of Excellence Award presented at a morning tea held at the Casuarina Centre. Congratulations to you both and the other St John Volunteers who were recognised at these events. On Saturday 18 November we held our annual NT Volunteer Awards night which was very well attended with our newly appointed Deputy Prior, the Administrator of the Northern Territory, Mrs Vicki O’Halloran and her husband Craig (our Patron) in attendance and officiating on the night. The response from our donors and long-term loyal supporters in attendance was just amazing with extra support being provided for the years to come. This event was followed the next day with our annual Church Service, which again was well attended and it was great to see our Members of the Order proudly processing pre and post the Service. Tennant Creek Ambulance station had the pleasure of receiving a group of students from the local High School for a day, which focused on careers for the young pupils and school leavers. This was the first of its kind for the area and a resounding success, with some 44 students attending in groups over the two days. It was great to see the interest and to have the opportunity to pass on all the information about what St John Ambulance in the NT does and the varied work opportunities that exist within the Organisation. The 25th was the night for our Darwin based Xmas party that was attended by over 120 of our people who had a great night (as the photos attest) with much fun and discussions on all that had occurred over the past year. Thanks to the group of Organisers headed up by Serena who did a great job in a good venue. In closing, and as mentioned in last month’s newsletter, I would like to say this will be my last introduction to our newsletter as I will be making way for a new CEO from the middle of December this year. It has been an amazing journey over my time with much to celebrate and to reflect on and to learn from. Our people are amazing and the work and support we provide to all Territorians goes well beyond what is asked of us all. I have loved my time here, enjoyed the challenges and I thank everyone involved for your support of, and belief in, me and our great Organisation, St John Ambulance NT. I wish everyone all the best for the future and there is no doubt I will be remaining in touch and will see you around from time to time. Have a great Xmas and New Year and may 2018 be even better for you than the years past. Best of the best on the move! In November, St John Ambulance NT were pleased to launch the trial of a new Intensive Care Paramedic Critical Response Unit (ICP CRU) in Darwin. Intensive Care Paramedics are highly experienced, highly trained clinicians with specialist skills to treat critically ill patients with life threatening conditions. They make complex medical assessments and use a vast range of special equipment and medications. In the paramedic field, they are regarded internationally as being the 'best of the best'. Staffed by a St John Ambulance Intensive Care Paramedic, the ICP CRU has commenced operating in Darwin 24hrs a day 7 days a week. A second unit will begin trials in Alice Springs and both units will undergo a 6 month clinical trial period and then be analysed to assess the impact of this new service. The ICP CRU is a new initiative, complementing St Johns' existing ambulance resource and focusing on rapid response, clinical assessment and advanced medical care. Matthew Eastham, Director of Ambulance Services said "This is an exciting development for the Territory and a commitment by St John Ambulance in the provision of enhanced services. Our Intensive Care Paramedics have years of critical care, areo-medical and medical retrieval training. 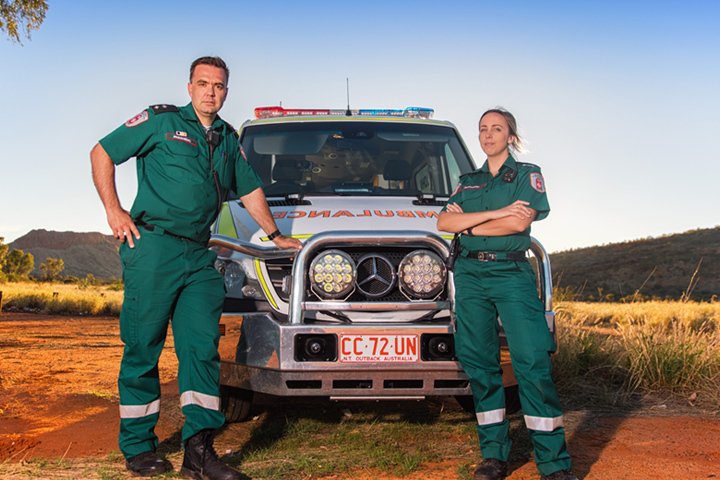 They are highly dedicated, skilled and have saved many lives throughout the Territory". Drink driving is a major issue for all Territorians. The problem is particularly highlighted around seasonal events such as Christmas, Easter, major community events and long weekends. Even a blood alcohol reading of .05 can double your risk of being involved in a vehicle accident. We at St John Ambulance were proud to be part of the launch for the ‘Who’s Your Sober Bob?’ campaign this month, encouraging Territorians not to drink and drive and use a designated sober driver to get home when they have been drinking. The aim of the campaign is to reduce and prevent alcohol-related road trauma on Territory roads, by thinking ahead and planning how you will get home safely before you go out. A Sober Bob is someone who is willing to get you home safely and may not necessarily be the person you are out with. It could be a mate, they can be the bus driver, taxi driver, mum, brother, girlfriend, or uncle. James Gardiner, Regional Manager for the Northern Region at St John Ambulance NT said “At St John Ambulance we want you all to have a safe and happy festive season, and that means planning ahead and having a Sober Bob to get you home safely. Don’t let drink driving be the reason we see you this Christmas”. This month, St John Ambulance NT visited Tennant Creek High School students in groups of year 7s, 8s and 9s to speak to them about having a career as a paramedic, becoming a volunteer, the training involved and the importance of everyone in the community to have CPR/ first aid training. The crew provided lots of skill stations to engage the students, including learning CPR on a manikin, using a stethoscope for heart and lung sounds, bandaging, learning the major organ anatomy and performing ECG tracings of each other’s hearts. There was also a tour of the ambulances so the students could see the work environment that paramedics operate in and all the equipment St John Ambulance stock inside the cars. St John Volunteers bag the big awards! Over 200 people filled the Darwin Convention Centre in November to recognise the amazing contribution made by volunteers, volunteer organisations, corporate volunteering programs and volunteer managers. Lesley King, a committed St John volunteer with over 40 years dedicated service behind her was crowned the NT Volunteer of the Year. The volunteer award ceremonies are an initiative of Volunteering NT and are held annually in Alice Springs and Darwin. St John Volunteers had success in both regions winning 5 individual awards and two volunteers being highly commended. The Central Australia winners were announced at an awards ceremony held at the Alice Springs Convention Centre on the 1st November and the Northern Australia awards ceremony was conducted at the Darwin Convention Centre on Thursday November 2nd. Fiona Reid of Tennant Creek Adult Division was highly commended in the Chief Minister’s Volunteer of the Year – Central Australia and Brian Ch’ng MStJ of Darwin Adult Division was highly commended in the Chief Minister’s Volunteer of the Year – Northern Region. Mark Ferguson, Director of Volunteer Services congratulated all award winners and said, “It is great to see the recognition for all of the hard work, dedication and exceptional service that these volunteers provide to the community”. Congratulations again to all the winners and to Lesley King for being named the 2017 NT Volunteer of the Year. More awards and recognition for our NT volunteers! At St John Ambulance NT we would like to congratulate all the winners and everyone nominated for an award at our Annual NT Volunteer Award Night on Saturday 18th November, held at The Mercure Airport Resort. The evening was very enjoyable and we were pleased to have the newly appointed Deputy Prior, the Administrator of the Northern Territory, Mrs Vicki O’Halloran in attendance and officiating on the night. St John Ambulance NT would also like to say a very big thank you to Area 9, Telstra Palmerston and Virgin Australia for their generous prize donations on the night.